- You’ll find the General Atomics Factory on the waterfront of South Boston, in the far east of the Commonwealth. It’s a short jaunt across the water from the Castle, and, if you haven’t been to the Castle yet, east of Diamond City. 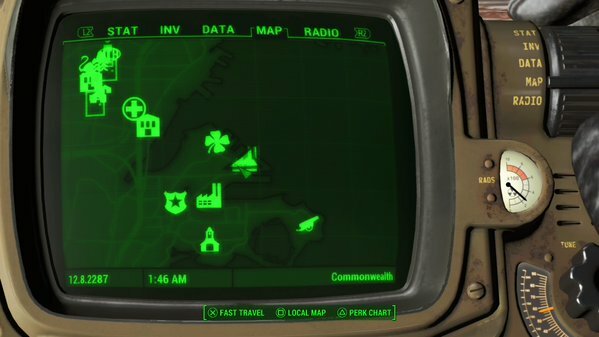 Expect hairy encounters with Super Mutants, Raiders, Gunners, and Ghouls if you plan to come here from Diamond City. The next pier over from General Atomics is home to three Mole Rat Brood Mothers, nasty, upgraded versions of Mole Rats. Kill them before they can burrow. Over here you’ll find a slew of human corpses; one of them is carrying the Settler’s Note. It has a few interesting words about a place called Nahant’s Church. And… Synths. To the northwest of the Factory is the Four Leaf Fishpacking Plant. It’s a part of the quest Diamond City Blues, as well as an explorable place in its own right. Watch out for Ghouls aplenty if you try to infiltrate the grounds. Across the street from the Factory is a three-floor construction site ruled by Super Mutants. They’re vicious opponents, but the nature of the building makes it easy to snipe them safely from a distance, if you don’t want to risk venturing onto their turf. They have assorted items and ammo, but nothing special. - The entrance to the Factory is right up front. There’s a terminal in the first room; have a look for some back info. Ahead and to the right are some bathrooms, but there’s little of use in ‘em besides some Buffout in the stalls. Ahead and up the stairs you’ll find a pair of Mr. Handies patrolling around, and they’ll cause you some minor trouble if you check their floor. Check the desks in the office they were guarding for a Tesla Science magazine. - On this second floor is an Expert locked door. Pop it open and you’ll find a terminal that makes reference to another area, the General Atomics Galleria. It’s a looooong way from here, and, surprise surprise, has you facing a lot of Codsworth clones. - Go through either the hacked door or the hole in the wall on the second floor. This next area has three floors and lots of patrolling Mr. Handies, and though they like to chatter, their movements are surprisingly quiet - and there are lots of passageways that allow them to sneak up on you. Keep a close range weapon on hand and take them down as you make your way up. There’s an Advanced locked door near the stairs from / to the first floor; inside you can find a Novice wall safe (look between the two desks) containing some nice goodies. - On the second floor is a room filled with white light. If you hack your way through the door you’ll find another Mr. Handy and two Turrets inside… as well as a Major Gutsy. This ‘bot, combined with the Turrets, makes for a painful approach if you open the door. You have one big advantage, however: you can shoot through the mesh to the left of, and above, the door. Better, depending on how it’s positioned, Major Gutsy can’t. Use the mesh to shoot everything inside, ducking out of the way if the Major gets a bead on you, and keep firing ’til you destroy the lot. If this is taking too long, at least destroy everything else in the room before letting Gutsy out for a brawl. - Check the room after you’ve taken out Gutsy. There’s an assortment of ammo and weapons in the trunk in the back, and an Armor Workbench by the trunk. Nothing amazing, really. The main thing to note about this room is the extreme Rad damage you’ll take (32 Rads!) if you try to walk to the left. Either put on a Hazmat suit or avoid the left side of the room. Doing this will gain you access to the safe sitting in the hallway. Inside you'll find three Fusion Cores, as well as a variety of other nifty items. - That’s all for the Factory. Beside the safe is a terminal. It will open a nearby door that leads back to the entrance. Bai bai, evil robots. Every time I turn the radio off the radio still says (activate). Has my game glitched from possibly having access to the safe and completing the puzzle? If the puzzle doesn't continue past that room, then, yeah, probably. The same thing happened to me the first time I tried. It seems to be a very glitchy puzzle, from what I've read. Try reloading an earlier save, if you're willing to backtrack. I would suggest saving before going for the first room of the three-room puzzle. As it is, I had no trouble with any part of it (though it took me a while to figure out that you had to throw the Machete, Abraxo, and fork in the trash). Still, it's best to save beforehand so that you can readily reload if you encounter a bug of some sort.